This week I did something I’ve probably done a hundred times before, but this time it felt absolutely absurd. It’ll probably be the last time I ever do it. What was this crazy event? I purchased shrink-wrapped software. It was an upgrade copy of Visual Studio 2010 (upgrade from 2008 Standard Edition). I had to add a cute little piggybank because otherwise it just looked pathetic. This little box of bits says it was “made in Puerto Rico”. I guess that means the RTM build was FTP’d to some server in Puerto Rico where it was burned onto a dual layer DVD. In fact it’s likely the DVD’s were burned somewhere else and shipped to Puerto Rico, but anyway, this DVD was then stuffed into plastic case along with a 5×7 piece of heavy stock paper with a beat up yellow sticker on it: the license key. This plastic case was then stuffed into a cardboard sleeve and shrink-wrapped. It probably made its way to a distribution center before being sold to an online distributor CDW, where it sat on a shelf for a few weeks. It was at this time that I started hunting around for a Visual Studio 2010 license. 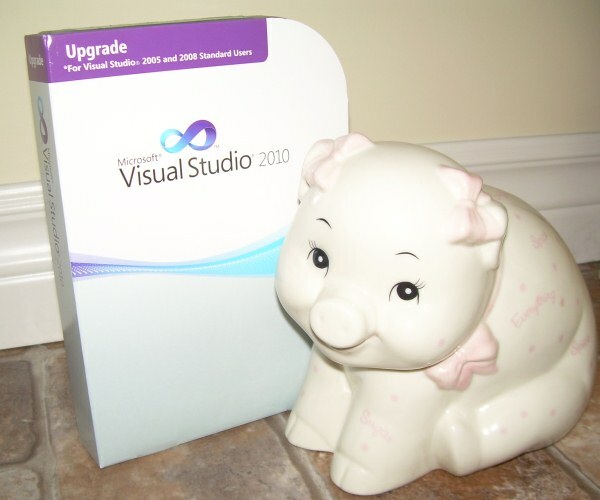 I had a copy of VS 2008 and I knew there was a discount for upgrades. You can actually download fully licensed copies from the Microsoft store for $399 (CDN), but I found this boxed copy for about $30 cheaper. Of course I still had to pay S&H, but that was about $13 (UPS Ground). That was on Friday. Today it’s Monday and I received a call from the local UPS distributor. They’d put it on the wrong delivery truck today, so they wouldn’t be able to deliver it until tomorrow. I wasn’t going to be home anyway, so I told them I’d pick it up tonight after work. I drove a good 25 km out of my way to go pick it up. The truck wasn’t back from its run yet when I got there, so I stood in line another 20 minutes waiting. I’m not knocking UPS here: their whole system boggles my mind. They knew exactly where this package was 100% of the time, even when it ended up being loaded on the wrong truck, and it was in my hand about 20 seconds after the truck pulled up to the building. Never underestimate the bandwidth of a UPS truck full of dual layer DVDs. After installing the software, the first thing it asks you to do is check for updates online. That’s because the version that came on the disk was probably out-of-date before it made it out of Puerto Rico. The only thing I really bought was a yellow sticker with my 16 digit license key on it. I could have downloaded a fully working copy last Friday night, and had it in about 2 hours. It would have worked for 60 days, and you could extend it for another 60 for no cost at all. The only thing of value was the legal right to use this software past the evaluation date. The 16 digit license key is only a proof of purchase. The absurdity of shipping useless plastic and paper all of the continent, driving out of my way and even standing in line to pick it up, just to “prove” that I paid for a legal license to use the software — it’s really striking isn’t it? What’s crazier is how normal this seemed ten or even five years ago! It’s not like I wouldn’t have purchased the $399 copy from Microsoft if that’s the only one I could find. I went through this because, well, given the chance to save about $15, I’m just cheap. I guess they figure some people won’t bother to pay money for something they can’t hold in their hand, but aren’t we past that now? Apple figured it out. Look at the iPhone App Store, and iTunes. If I relate this story to my daughter ten years from now, she’ll think I’m nuts. You bought software how? Why?!? Well, good riddance, shrink-wrapped software. Rest in peace. That is just too funny! I’m glad to see BACS is still going strong!